There's been a story developing in my neck of the woods for the last year or so, that is beginning to gain national attention, and deservedly so. Because the story is a microcosm of the larger socio-political world we're living in, and one that presents a clear choice for the future of our country, especially as it pertains to the upcoming elections. Freeport, Illinois is a typical Midwestern small town, about 30 miles from where I live. (King-Cat readers may remember me talking about wanting to move there in issue #65.) One of the industries in Freeport is a Honeywell automotive sensor making plant. In early 2011 it was reported that a company called Sensata Technologies had purchased the sensor-making business, and planned to ship the 170 jobs at the plant to China within two years. Now, those two years are up. The plant is moving overseas. Well, it turns out that Sensata Technologies itself was purchased in 2006 by a firm called Bain Capital. Bain Capital?? Where have I heard that before...? Oh yeah, it's the company that presidential candidate Mitt Romney created to purchase businesses, manage them briefly, and then "harvest" them for a profit (his words). Bain Capital is now "harvesting" the jobs of 170 working class American people. Yes, that's right-- right here, right now, the Republican candidate for President, in the middle of a presidential campaign, is making a profit off shipping American jobs to China. And this is how Mitt Romney plans to bring manufacturing back to the US? Workers at the sensor plant made up to $17.00 per hour. The Chinese workers replacing them will make 99 cents an hour. Management in many cases forced soon-to-be laid off workers to train their Chinese replacements, who in China will work up to 16 hour shifts per day, with one day off per month. Sensata is a non-union plant. So all you right wingers who try to pin the blame for the death of American manufacturing on unions, I'd like to hear who your scapegoat is this time. And this is also not a case of someone buying a dying business and selling it for parts. Sensata made 500 million dollars net profit in the second quarter of 2012. I guess that wasn't enough money for the shareholders? As I've written before, when will these people be satisfied? How much suffering imposed upon regular Americans for the profit of the rich will be enough? Where does the greed end? I used to think it was in the best interests of those with wealth and power to have a stable, comfortable middle class below them. Stable, comfortable middle class people bear the costs of running our society, they like the status quo, they don't want to rock the boat, and they buy lots and lots of consumer goods. It has occurred to me over the last several years, that these people don't give a damn about the middle class, or anyone for that matter, outside their circle of friends (and I wouldn't even count on that!). Thanks to globalization, they don't need an American middle class anymore. I see our society quickly slipping into a kind of modern day feudalism, where those with money and power live in castles on the hill, while the rest of us peasants muck it out in the valley. The two worlds are not connected anymore. They don't give a damn about American workers, or those in need, why would they? Their focus is on the expanding markets of China and India. They took away people's jobs, then conned them into three decades of debt-maintained lifestyles, and now that's over too. To them, America is a husk that's been drained of resources and buying power. They are living in America, but not of it. They couldn't care less. All that matters to them is their pathological accumulation of money, no matter the damage it inflicts on others. American jobs -- how quaint! A thriving middle class-- no longer necessary! A few days ago the progressive talk show host Ed Schultz came to Freeport, where the displaced workers have set up a protest camp across the street from Sensata, named Bainport. I drove out to show my support and see what the scene was like. The road to Freeport is straight down beautiful Highway 75. The Freeport High School sports teams are famously named the Pretzels. Cheri Bustos, congressional candidate for Illinois' 17th District, and Congresswoman Jan Schakowsky talk to Ed. Look at faces on these people. These are ordinary, working class people. We're witnessing the development of a new populist political movement in the United States. The Nation's John Nichols and Ed joke around with the crowd. Make no mistake, Sensata is the economic future that the Mitt Romneys of this country are shooting for. To elect him president of the United States would be the worst case of putting the fox in charge of the hen house that could be imagined. If you agree with me, please do your part to help re-elect Barack Obama on November 6th. Vote, of course, but try to find other ways to help. Tells friends and neighbors about Sensata, and what it means for the future of our country, volunteer in get-out-the-vote drives, stand on the corner and wave a sign. In these difficult times, anything helps. The right wing in this country is counting on fear, misdirection, corruption and lies to give them even more power. But I guarantee you there are more of us than there are of them: 99%. Stand up for yourself and your family and neighbors. This is it. American Conservative (! ): "Revolt of the Rich"
Friday afternoon I headed up to Minneapolis in a rainstorm, which quickly abated by the time I got to the I-90 split, and turned into a beautiful Midwestern fall day. Stopped first at Big Brain Comics, which surely has to be one of the best comic shops in the country, even if it's run by an unrepentant Packers fan. Owner Michael and I talked football as I browsed, and then it was time for bed. Drove over to Zak's place where we stayed up too late talking and trying to watch Dark Star before nodding off. I got up early the next day and headed over to the Twin Cities Zine Fest. Zine fests are the best. And this one even had vegan gluten free muffins for the exhibitors! Uncivilized Books Head Honcho Tom K., with Gabrielle Bell's new book The Voyeurs. TCZF organizer Lacey Prpic Hedtke, with muffins. Spit and a Half intern Marissa Luna, hard at work. Kings of the Minneapolis comics scene, Robert Kirby (left) and Tom K., discuss which territories to conquer next, and how said territories shall be divided upon conquering. These dudes were offering free silk-screening fun. Above, the print I pulled. Viva la Papier! The Fly Away Zine Mobile was out in the parking lot. Zine Mobile driver, janitor, and CEO Debbie Rasmussen. Why am I always the last one to leave? I had a couple hours after Zine Fest closed before I had to be at Boneshaker Books for a signing . So Zak and I went out for tacos, con los munchkins. The reading went well. Boneshaker was a wonderful shop, well curated, and full of community energy. That night: Comics makes for strange bedfellows. Isaac, looking a lot like Papa. Heading back home, with the first half of Bear-Rams on the radio. After leaving Pittsburgh Tuesday morning, we headed west on I-70, into Columbus, the Next Seattle®. Sold some comics at Used Kids, then headed across the street to the Cartoon Research Library, where we met up with fellow SPX traveler J.T. Dockery, and Associate Curator Caitlin McGurk gave us a behind-the-scenes tour. I'd been to the library many times -- in fact I think it was the place where I first met Dylan Williams, pouring over old White Boy comics with cotton gloves on -- but I'd never been behind the magic door where all the comics are actually archived. It was a cartoonist's dream! 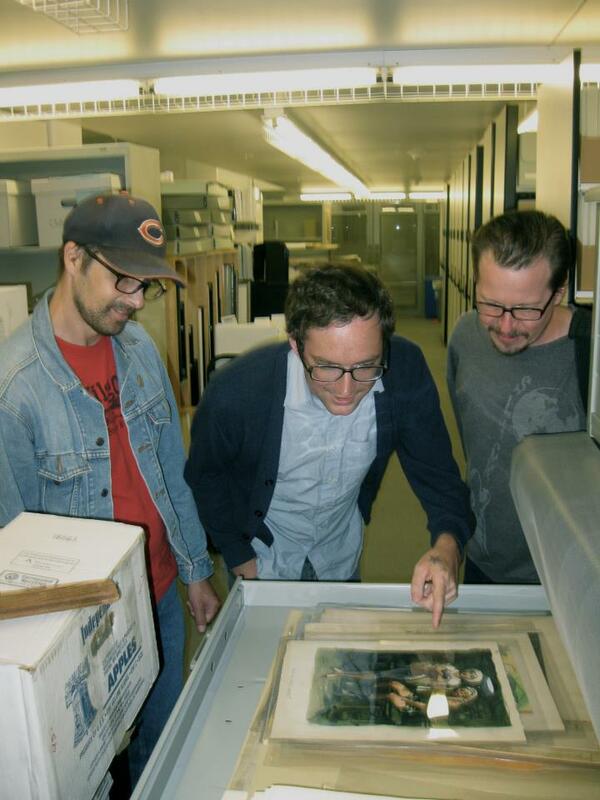 JP, NVS, and JTD view an original Jack Davis drawing. The back room was full of sliding shelves, flat files, photographic equipment, and books, lots of books. We got to look at original Windsor McCays, Segars, Bushmillers, and much more. Amazing. Just three dudes, hangin' out. After selling comics to the good ol' Laughing Ogre, we made our way further west to Indianapolis, where I had a couple shops to drop off King-Cats at-- Comic Carnival and Luna Music. Then back on the highway for the dreaded trip up to Chicago. Dreaded because this stretch of interstate between Indy and Chicago is almost always snarled with terrible traffic-- giant trucks going 85 and pickup trucks going 40. And delays, construction, and slowdowns. We were cutting it close... but we made it to Chicago with time enough to stop at Sultan's Market before the event at Quimby's. Is Quimby's the best weirdo bookstore in the country? The world? Quimby's not only has cool books, but cool staff too, notably the great Edie Fake and Neil Brideau. JP and Felicia, lifelong (I hope-- for her sake!) King-Cat fan. We drove back to Beloit that night, and the next morning I took Noah to the airport. When I got back I commenced power-sleeping, because the next day I was heading up to Minneapolis, for the last leg of the trip.